Rapper Kendrick Lamar attends the conversation with Kendrick Lamar and Jessie Wright at the 2013 SXSW Music, FIlm + Interactive Festival on March 14, 2013 in Austin, Texas. Kendrick Lamar stuck to a casual and cool look at SXSW with basic skinny jeans and a print tee. 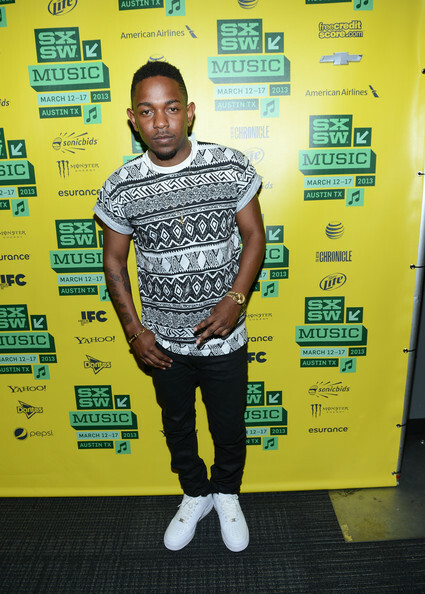 Kendrick Lamar paired this print t-shirt with skinny jeans for a quirky but cool red carpet look at SXSW.